Leicester has officially become the only UK city to join a global campaign developed to raise awareness of and prevent type 2 diabetes around the world. Leicester's involvement in the worldwide programme, developed to raise awareness of type 2 diabetes, was made official at a launch event on Tuesday, May 1 at the City Hall between noon and 4pm. The city-wide campaign, led by the Leicester Diabetes Centre is in partnership with Novo Nordisk and Leicester city stakeholders. 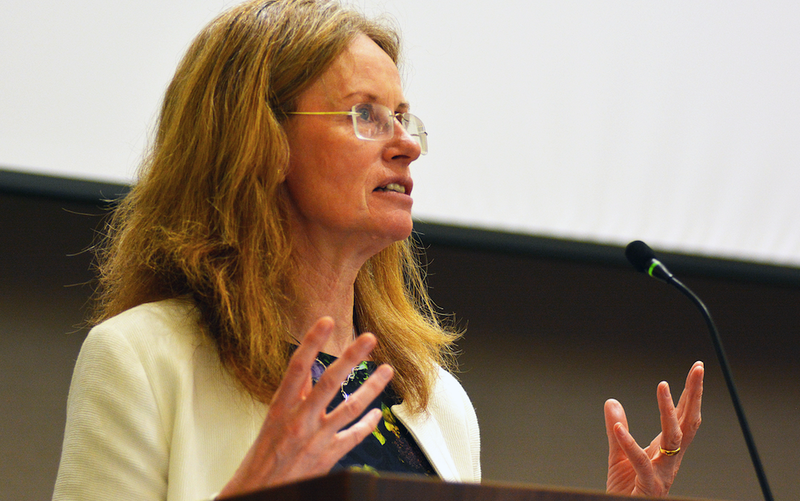 Professor Melanie Davies CBE, Professor of Diabetes Medicine at the University of Leicester, said: "We were thrilled at how many stakeholders attended the event, which brought everyone together so we could share and discuss ideas about the best way to tackle the urban diabetes problem." Professor Davies delivered a presentation explaining why Leicester was asked to join the programme and what the team's future plans are. She called diabetes, "one of the most pressing health challenges of the decade". Later on she added: "We're the first city in the UK to join the programme and one of only a few in Europe to join up and bring together the hospitals, the University of Leicester, GPs and patients along with the City Council, our sports clubs and our community groups to really work together to make a difference in our city to try to tackle this urban problem of diabetes. The event saw several other speakers take to the stand, including Adam Burt from Novo Nordisk. He said: "We're very excited about Leicester coming on board. It is a city that is ethnically and culturally diverse. We have a world-leading diabetes centre that is driving the project. We have huge engagement from local government and other local organisations with an interest in what the programme is all about. "This is about helping people at risk of developing type 2 diabetes and to support and improve the lives of those who already have the condition. Stuart Nelson, vice president of the Institute for Spirituality and Health at the Texas Medical Centre, USA, travelled all the way from Houston - the first city where the programme started - to attend the launch event. He has been involved in the programme for two years and told attendees all about an initiative he works on called Faith in Diabetes. The programme was developed to engage leaders within communities of faith around diabetes awareness, prevention, and treatment. Central to The Faith and Diabetes Initiative is the Congregational Health Leadership programme, which empowers lay leaders in diverse communities of faith to address pressing health issues, with a special focus on diabetes. Stuart said: "We're very proud of it and feel it can be replicated here in Leicester." "The reason i'm really proud that this has come to Leicester is because we have a really diverse community and we have a fantastic track record of research in diabetes. We've also got a really engaged community, so we had people from the City Council, from community groups, our elite sports clubs and schools attend the launch. "They are all really passionate about working together to try to make a difference in our city and help make Leicester stand-out as one of the best cities in the world that are working together to tackle this problem." Professor Khunti, Professor of Primary Care Diabetes and Vascular Medicine at the University of Leicester, said: "It's been a great day. We've had a full house with people from all around the world who have come along to talk to us about how we can change this tsunami of diabetes within Leicester city. "We were obviously enormously proud when Leicester was chosen as one of the Cities Changing Diabetes by Novo Nordisk. This is a huge accolade because we were competing with many, many big cities and to have Leicester as the first and only UK city to be chosen is enormous for us." Keith Vaz, Leicester MP and chairman of the All Party Parliamentary Group for Diabetes, also attended and spoke at the event. During his presentation he outlined how important he felt awareness of diabetes was before anything else could be done about tackling the condition. He said: "Without awareness, you cannot actually get to the second stage. And as part of what you're doing with your project, we need to get the whole city involved. "Not everybody is going to know what the complications of diabetes are, not everybody is going to know the intricate details of diabetes. But we need to make them aware."